Samsung DV409AEW Neat white Steam Electric Dryer 7.4 cu. ft. 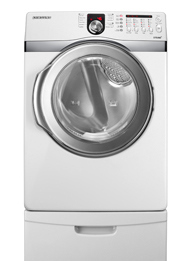 The DV409AEW is another model available in the line of dryers made by appliance manufacturer Samsung. With its 7.4 cubic feet capacity, you can certainly say this model can save you lots of time when drying loads of laundry. Large batches can be done in one load with this steam electric dryer. You also will have your ironing time decreased with wrinkle release, a drying cycle that prevents creasing from multiplying in the items being dried. This model also gives you 5 ways to conveniently dry clothes, giving you free reign on which you think would be most effective on the load you’re going to dry. The steam clean function gives your laundry items a fresher and safer wash, giving your clothes a longer life. The 5 dry levels give you guaranteed results depending on which level you choose. No surprises by choosing either Very Dry, More Dry, Normal Dry, Less Dry or Damp Dry. The stainless steel material that is used to make the interior drum does not chip, corrode or rust, preventing clothes from getting paint or material chips, getting discolored and having rust. The Steam Refresh and WrinkleCare Cycles with the Steam cycle settings reduce wrinkles, remove odors and refresh clothing without putting too much pressure or power into the drying process. You can be sure there won’t be sun-dried or burning smell for your clothes. The 11 preset dry cycles give you all the options you need to getting your laundry load perfectly dried. Choose from Steam Refresh, Steam WrinkleCare, Sanitize, Heavy Duty, Normal, Towels, Permanent Press, Delicates, Time Dry, Air Fluff, and Quick Dry. The control panel of the dryer is filled with state-of-the-art electronic controls, including touch pads and knobs that allow you to precisely and conveniently select settings and options without having to do guesswork or estimate. The dryer door can be changed to open or close from either direction. This is a great benefit particularly for users with limited area for their laundry appliances. Equipped with an red LED display, you will be visual informed of matters that you would need to have peace of mind regarding the dryer’s operations such as remaining cycle time and other dryer options and functions. Adjust Time allows you to manually adjust the time if you feel that the drying cycle should be longer or shorter. This is perfect when used with the Adjustable Level of End of Cycle feature. The Child Lock is perfect for households with children in them, so that the dryer does not become a safety hazard. This, together with the Door Safety Lock ensures that no accidents will happen with using this dryer. The Drum Light in the interior of the dryer gives you sufficient illumination so that you won’t miss any item when unloading. The Lint Filter Indicator is a handy tool that allows you to be informed if the filter needs to be cleaned already, increasing the machine’s efficiency. Some first time users are not that comfortable with how some functions in their machines do not work that well, adding to their frustration with insufficient customer services. Join in and write your own page! It's easy to do. How? Simply click here to return to Samsung clothes dryers.